Leaf epicuticular wax is an important functional trait for physiological regulation and pathogen defense. 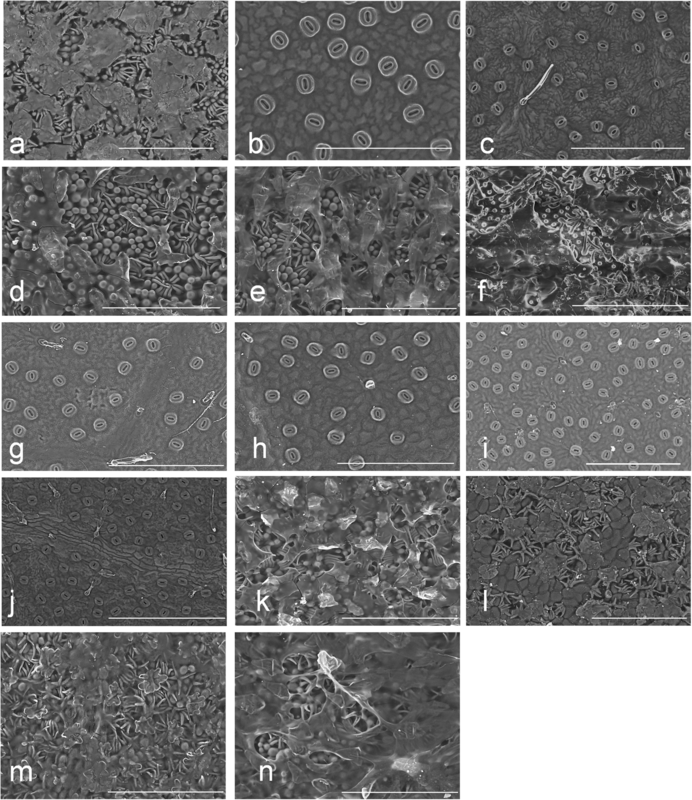 This study tests how selective pressure may have forced the trait of leaf abaxial epicuticular wax crystals (LAEWC) and whether the presence/absence of LAEWC is associated with other ecophysiological traits. Scanning Electron Microscopy was conducted to check for LAEWC in different Lithocarpus species. Four wax biosynthesis related genes, including two wax backbone genes ECERIFERUM 1 (CER1) and CER3, one regulatory gene CER7 and one transport gene CER5, were cloned and sequenced. Ecophysiological measurements of secondary metabolites, photosynthesis, water usage efficiency, and nutrition indices were also determined. Evolutionary hypotheses of leaf wax character transition associated with the evolution of those ecophysiological traits as well as species evolution were tested by maximum likelihood. Eight of 14 studied Lithocarpus species have obvious LAEWC appearing with various types of trichomes. Measurements of ecophysiological traits show no direct correlations with the presence/absence of LAEWC. However, the content of phenolic acids is significantly associated with the gene evolution of the wax biosynthetic backbone gene CER1, which was detected to be positively selected when LAEWC was gained during the late-Miocene-to-Pliocene period. Changes of landmass and vegetation type accelerated the diversification of tropical and subtropical forest trees and certain herbivores during the late Miocene. As phenolic acids were long thought to be associated with defense against herbivories, co-occurrence of LAEWC and phenolic acids may suggest that LAEWC might be an adaptive defensive mechanism in Lithocarpus. The evolution of a waterproof epidermis is considered important for plants’ colonization of the land . A waterproof epidermis trait, such as leaf epicuticular wax, is a kind of xeromorphic feature  which helps reduce the evapotranspiration rate and allows a plant to adapt to an arid environment [2, 3]. In the case of leaf epicuticular wax, it thickens the boundary layer to reduce evapotranspiration, but its appearance may also reduce the absorption of CO2 and reduce photosynthesis efficiency. The partial pressure of CO2 is small (0.01~ 0.036%) and the heavier molecular weight of CO2 than H2O leads to a slower CO2 diffusion rate than evapotranspiration rate and so the appearance of leaf epicuticular wax is suggested as an advantageous feature for adapting to arid environments . The accumulation of leaf epicuticular wax is thought to be regulated by light intensity and relative humidity, suggesting that the water regulation of epicuticular wax may be attributed to environmental signals . In addition, the hydrophobic nature of epicuticular wax could decrease the contact area of water, causing water to drain more quickly  which, in turn, aids in the removal of dust, bacteria, and epiphytes (i.e. self-cleaning, the Lotus effect). Epicuticular wax may also help maintain the physical integrity of plant leaves by reducing damage caused by pathogens . Therefore, it is suggested as an adaptive indicator of the physical defense of plants . The biosynthesis of epicuticular wax occurs in epidermal cells, in which the very-long-chain-fatty-acids (VLCFAs) are synthesized in endoplasmic reticula. Following this is modification and regulation which synthesizes the precursor of wax. This is then transported to the outer membrane via the ATP-binding cassette (ABC) transporter . Upregulation of wax biosynthetic genes in Arabidopsis is a response to the water content of plants in the face of flooding or drought stress [9–12]. Transcriptomic comparisons between the domesticated tomato (Solanum lycopersicum) and the desert-adapted accession (Solanum pennellii) revealed differential expression in several wax biosynthetic related genes, including the ECERIFERUM1 (CER1), CER2, CER3, CER4, CER5-like, CER6, CER7, CER8, CER10, LIPID TRANSFER PROTEIN1 (LTP1), LTP2, WAX INDUCER1 (WIN1), etc. . These wax-biosynthetic genes can be placed into three categories: the backbone genes, regulation genes, and transporters. For example, the backbone gene CER1 interacts with CER3 with both jointly responsible for the synthesis and modification of VLC-alkane . CER3 catalyzes the VLC-acyl-CoAs to VLC-acyl and then CER1 transforms it to the VLC-alkanes . In addition, both genes are also pleiotropic and involved in morphogenesis in the wax exine of pollen and adaxial epidermal cell wall [15, 16]. Furthermore, CER7 inhibits the RNA repressor of CER3 to positively affect the biosynthesis of VLC-alkanes . Heterodimers of CER5 and the ABC transporter G family member 11 (ABCG11, also called white-brown complex homolog protein 11, the WBC11) are involved in the exportation of wax components to apoplast . The cer5 mutant of Arabidopsis revealed a lower content of epicuticular wax than the wild type , evidence that the expression of CER5 affects the phenotype of leaf epicuticular wax. Geographic differentiation of epicuticular wax composition, e.g. the carbon number of alkane backbones of wax, is thought to be a consequence of local adaptation to environmental differences such as precipitation and temperature . This implies that leaf epicuticular wax is a functional trait, defined as the morpho-physio-phenological character contributing to environmental adaptation . Functional traits are usually interdependent [22–24] and covariation among functional traits may reflect the causality or coordination between functional traits  which are adopted for maximizing performance in a given environment . For example, a positive correlation was found between trichome density and latex production, and between C:N ratio and leaf toughness in milkweeds (Asclepias spp.) . The trade-off between defensive characters, such as epicuticular wax, and growth-related characters, such as carbon, nitrogen, photosynthetic parameters, etc., is suggested as another interdependent relationship between functional traits [27–29]. The allocation of resources in physical and chemical defense was hypothesized to reduce unnecessary waste of resources, as another trade-off strategy for adaptation [30–32], or alternatively, was suggested as an integrated defense strategy against a wide range of herbivores . The objective of this study was to test the adaptive hypothesis of leaf epicuticular wax in Lithocarpus and determine the relationship between leaf abaxial epicuticular wax crystal (LAEWC) and other functional traits. Genus Lithocarpus is a group of tropical and subtropical Asian tree species commonly known as stone oaks [34, 35] grouped with Castanopsis, Castanea, Quercus, and Chrysolepis [36, 37]. All of the Lithocarpus species whose chromosome numbers have been checked are reported to be 2n = 24 and are unlikely to be polyploids (; The Index of Plant Chromosome Numbers, http://www.tropicos.org/Project/IPCN). Roughly half the known species are locally endemic to mainland China, adjacent islands, and Borneo [39–41], suggesting the species of this genus are highly adaptable to environmental changes. The adaptive characteristic is revealed in phenotypes, such as differences in epicuticular wax crystals and trichomes on leaf surface [42, 43], and reflect environmental variations. Drastic climate change during middle-to-late Miocene to the Quaternary (Pliocene and Pleistocene) is suggested as a major force affecting the current distribution and diversification rate of Lithocarpus . Past climate change attributed to glacial oscillations which had a major influence on temperature and precipitation, may have directly or indirectly affect plant growth due to limits on water usage and photosynthesis efficiency . Here we use Lithocarpus as a way of answering the question of whether the trait variation of leaf epicuticular wax adaptively reflects environmental change with other co-varied ecophysiological traits. After confirming the presence/absence of leaf epicuticular wax by microscopic observation, three questions were explored in this study: (1) Are LAEWC related genes adaptively evolved? (2) Is the presence/absence of LAEWC co-varied with ecophysiologically functional relevant traits (e.g. chemical defensive and photosynthetic characters)? (3) Is the presence/absence of LAEWC related to environmental variations? We also calculated the time when the positive selection of the trait took place as well as tested the phylogenetic signal (PS) of the ecophysiological traits and environmental factors with the species evolution and gene evolution for understanding the trends of co-evolution of these functional traits. This study integrates evidence from ecophysiological and climatic data with evolutionary genetic analyses to illustrate the adaptive evolution of LAEWC of Lithocarpus. Fourteen Lithocarpus species grown in the Fushan Botanical Garden, a long-term ecological research (LTER) site for the subtropical forest in northern Taiwan, were collected for morphological, genetic, and ecophysiological surveys. Scanning Electron Microscopy (SEM) was conducted to check for the presence/absence of the epicuticular wax crystals on the leaf surfaces using the tabletop SEM TM3000 (Hitachi, Tokyo, Japan). Small pieces of fresh blades (5 mm × 5 mm) between the leaf margin and midrib were cut for microscopic observation and at least two individuals were adopted for checking the presence/absence of the epicuticular wax crystals at an accelerating voltage of 15 kV in order to obtain high image resolution signals. We sampled fresh leaves from one individual of each species, the fresh leaves were stored in the RNAguardian solution (MBGEN Bioscience, Taipei, Taiwan) at − 80 °C. RNA extraction followed Gambino et al.’s  approach and removed sugars and polyphenols using CTAB lysis buffer and genomic DNA with TRIzol (Life Technologies Corp. California, USA). In order to understand genetic variation and to test selective pressure by comparing the evolutionary rates of genes, four candidate genes involved in wax backbone synthesis (CER1 and CER3), regulation (CER7), and transportation (CER5) were chosen for cDNA sequencing. Other genes such as WIN1, waxy, and ECR which are also involved in wax synthesis failed to amplify and could not be used for this study. Therefore, only the four CER candidate genes were identified as LAEWC related genes in this study. Six wax-unrelated genes (CAP, DGD, ESRK, FAD, SAHH, and SAM) were also sequenced as reference genes from genomic DNA. All selected genes, including the four LAEWC related genes and six wax-unrelated genes, are homologous based on specific primer selection and multiple checks with by sequencing of the cloned amplified products. Primer sequences, sequence information including sequence length and percentage of coding region and GenBank accession numbers are listed in Additional files (Additional file 1: Table S1). These genes have functions in other tissues including pollen and adaxial epidermis in other plant species [15, 34] so we focus on those genes expressed in leaf tissue of species with and without LAEWCs. The amplified cDNA fragments were cloned using a yT&A cloning kit (Yeastern Biotech, Taipei, Taiwan). Three clones from each species were chosen for subsequently sequencing and the M13F/M13R were used as the primer for sequencing. Bidirectional DNA sequencing was conducted using ExoSAP-IT (Thermo Fisher Scientific Inc., Waltham, MA, USA) and ABI BigDye 3.1 Terminator Cycle Sequencing Kit (Applied Biosystem, Foster City, CA, USA) and conducted by ABI PRISMH® 3730XL DNA Sequencer (Perkin-Elmer, Foster City, CA, USA). Due to little variation in chromosome number in the Lithocarpus species (almost all reported species are 2n = 24, ; The Index of Plant Chromosome Numbers, http://www.tropicos.org/Project/IPCN) and the unlikelihood of polyploidy, the possibility that different clones are homoeologs was not considered in this study. All sequences presented in this study were deposited in the NCBI GenBank under Accessions KY458808-KY458955. DNA sequences were aligned and checked with the assistance of BioEdit . The aligned sequences of every gene were used for phylogenetic reconstruction by the neighbor-joining (NJ) method, maximum-likelihood (ML) method, and Bayesian inference (BI) using MEGA 6.0 , PhyML 3.0 , and MrBayes 3.2 , respectively. For NJ tree reconstruction, the maximum composite likelihood model was used as the nucleotide substitution model and pairwise deletion was set for gap treatment. For PhyML, nearest neighbor interchange (NNI) was used for tree searching and approximate likelihood-ratio test (aLRT) for estimating branch support. For BI tree, two parallel Markov chain Monte Carlo (MCMC) simulations of 10 million generations with 10% burn-in were used for obtaining the consensus tree. Six reference genes were also used for reconstructing the species tree. Due to the unavailability of the sequences of closest outgroup Chrysolepis, we chose Quercus robur, Castanea mollissima, and Fagus sylvatica as outgroup in BEAST 1.8.2 . One-hundred million years ago (Mya) as the origin time of Fagaceae  and 60 Mya when Fagus and Castanea diverged  were used as calibration points for molecular dating under the lognormal relaxed molecular model. Yule’s pure-birth speciation model was chosen as the speciation model for species tree reconstruction. One-thousand million MCMC generations with a sampling of every 10,000 generations were used in summary statistic. The character state of LAEWC was then mapped to the species tree for hypothesizing trait-shift events. It should be noted that while the outgroup Q. robur is coded as “absence” of LAEWC, most of Quercus species revealed “presence” . The closest outgroup Chrysolepis reveals “absence” of LAEWC  but the sequences and materials of that outgroup were unavailable for this study, so we adopted Q. robur for rooting but kept the “absence” state in outgroup LAEWC. In order to test the selection signals of the four LAEWC related genes, substitution rates of all nucleotides of a gene (K), nonsynonymous nucleotide substitution rates (Ka) and synonymous substitution rates (Ks) of each LAEWC related gene were compared to that of reference genes. The dependent two-group Wilcoxon Signed Rank Test (WSRT) and simple linear regression (SLR) were used for testing the group differences between LAEWC related genes and reference genes. Due to the uncertainty of the ancestral state of LAEWC in Lithocarpus, we developed three scenarios which consider either the presence or absence of LAEWC. We then tested for the positive selection of trait shifts of LAEWC under three scenarios: (1) positive selection on independent gain events of LAEWC, (2) positive selection on independent loss events of LAEWC, and (3) positive selection on an early gain event of LAEWC and a following loss event (Fig. 1a-c). The branch model under the codeml analysis of PAML v.4  was used for hypotheses testing and the Ka/Ks (ω) > 1 was taken as the signature of positive selection. The model of constant evolutionary rate constraint on ω < 1 around all branches of the tree was used as the null hypothesis (Fig. 1). Likelihood ratio test (LRT), which calculates the 2× differences of log likelihood between null and alternative hypotheses (2ΔL), was used for evaluating the best fit selective hypothesis by χ2 test. The presence or absence of LAEWC was suggested to be related to photosynthetic efficiency and water use efficiency (WUE = net photosynthetic rate/transpiration rate) [56, 57], carbon storage efficiency , and insect and pathogenic stress defenses [58–60], etc. Therefore, several environmental and ecophysiological parameters were measured for correlation with the LAEWC trait. However, as the experiments were all confined to plants growing in the Fushan Botanical Gardens and not in their original habitats, not all environmental factors could be directly measured or taken into account. In addition, WUE related characters such as stomata morphology of this genus have been reported in previous studies not to vary significantly between species [42, 43]. First, we measured the phytochemical yield of photosystem II (YII), which is an indication of energy used in photochemistry by photosystem II under steady-state photosynthetic lighting conditions, i.e. as an index of photosynthetic efficiency. More than 20 samples per species (n = 20~ 52) were measured for YII and three measurements of every leaf sample were averaged. YII was measured using MINI-PAM-II Photosynthesis Yield Analyzer (Heinz Walz GmbH, Germany). Phenolic acids (PA) are a group of secondary metabolites related to pigmentation, growth, reproduction, resistance to pathogens and herbivores, etc. and represent adaptive characters that have been subjected to natural selection . The PA are also thought to serve a chemical ecological role in plant resistance to fungal pathogens and phytophagous insects . Dried leaves (0.1 g) were placed in a 60% methanol solution (contain 3% HCl), and then subjected to centrifugation for 10 min at 4 °C (3000 rpm). Total phenolic content was determined with the Folin-Ciocalteu reagent according to a procedure described by Singleton and Rossi . Briefly, 100 μL of the sample was mixed with 2 mL 2% (w/v) sodium carbonate solution for 2 min, and then 2 mL of 50% Folin-Ciocalteu reagent was added into the reaction mixture. The absorbance readings were taken at 750 nm after incubation at room temperature for 30 min. Gallic acid was used as a reference standard, and the results were expressed as milligram gallic acid equivalent (mg GAE)/g dry weight of herbal material. All species were measured four to five times and any outliers in the data discarded. Carbon content (C) is attributed to the lignin, cellulose, and carbohydrates , and is positively associated with environmental light conditions and negatively correlated with insect herbivore abundance . Leaf nitrogen content (N) is an integral component of protein RuBisCO and tends to correlate with the maximum photosynthetic rate  and is positively related to growth rates and energy supply . The leaf C/N ratio is a proxy of nutrient limitation (cf. [67–69]) and usually correlates with the potential growth rate (cf. ). In addition to the leaf C and N content, we also measured the isotopic signature of leaf materials using the ratios of stable isotopes (R) of 13C/12C and 15N/14N and calculated the delta (δ) notation by the equation δ = [(Rsamp/Rstd)-1] × 1000‰, where the Rsamp and Rstd are the isotopic ratios of samples and international standards (Vienna Pee Dee Belemnite for δ13C and air N2 for δ15N), respectively. Since during the carbon fixation process of photosynthesis, the RuBisCO can more easily utilize the 12CO2 that may cause a lower concentration of 13C than the atmospheric 13C, the δ13C can accurately reflect the carbon fixation (CO2 uptake) efficiency of photosynthesis; similarly, the δ15N can also more accurately reflect the reaction efficiency of RuBisCO than leaf N content . The δ15N is also suggested as an integrating parameter conditioning plant responsiveness (e.g., photosynthesis and water transpiration) to environments. For measuring the C, N, δ13C, and δ15N, leaf samples (n > 5 per species) were completely dried (oven-dried at 50 °C > 7 days) and ground into powders and mixed thoroughly. Dried powder samples were sent to SGS Taiwan Ltd. for measuring the C, N, δ13C, and δ15N following the protocol of Carter and Barwick . Logistic regression was performed using the generalized linear model for testing the correlation of the ecophysiological traits with the presence/absence of LAEWC. LRT was used for comparing the null model. Phylogenetic principal component analysis (pPCA)  was conducted using all of the ecophysiological measurements and the altitudinal factors (the lowest (min Alt), highest (max Alt), middle altitudinal distributions (mid Alt), and the altitudinal range of distribution (ΔAlt)), with implementation of the R packages phytools . We further tested whether these traits were synchronously co-adapted with the LAEWC related genes by PS tests. Pagel’s λ  and Blomberg’s K , which operate under the assumption of Brownian motion of trait evolution , were used for testing the significance of phylogenetic correlation with traits. These analyses were based on the species tree and four gene trees of the LAEWC related genes. If the ecophysiological trait revealed significant PS with the species tree, the trait was suggested to fit the phylogenetic niche conservatism hypothesis (PNC, if K > 1 ), or the character evolution fits a randomization process and is unrelated to the species evolution [77, 78]. If significant PS was detected with the gene tree, the trait was suggested to be coadapted with this gene. In all examined Lithocarpus species, the stomata are presented on the abaxial surface only with no infraspecies variations (Fig. 2). According to the SEM observation, eight species have LAEWC, including L. amygdalifolius, L. dodonaeifolius, L. formosanus, L. glaber, L. lepidocarpus, L. nantoensis, L. shinsuiensis, and L. taitoensis (Fig. 2). The LAEWC are mostly thin film and flaky (Fig. 2). The leaf abaxial trichomes were observed accompanying the presence of the LAEWC (Fig. 2). In contrast, the other six species (L. brevicaudatus, L. cornea, L. hanceii, L. harlandii, L. kawakamii, and L. konishii, Fig. 2) lack LAEWC and show very few and sparse trichomes, presenting a glabrous and stomata-naked surface. The adaxial surfaces of all six examined were glabrous and lacked epicuticular wax crystals (Additional file 1: Figure S1). To ensure that the presence/absence of LAEWC is not plasticity and environmental influences, we also check consistency between our results and specimens from previous study . All species adopted in both our study and previous study show consistency in presence/absence in LAEWC, and revealed strong stability in presence/absence in LAEWC. In general, five types of abaxial leaf surface were classified: (i) solitary unicellular trichomes growing through wax and stellate trichomes in the crack of the film-shaped wax crystals (Fig. 2a, d, m, n); (ii) almost full coverage of film-shaped wax crystals in the leaf abaxial surface (Fig. 2e); (iii) dense of solitary unicellular trichomes growing through pieces of wax crystals (Fig. 2f); (iv) solitary unicellular trichomes growing through pieces of wax films with uncovered stellate trichomes (Fig. 2k, l); (v) the naked stomata and no wax crystals covering the leaf abaxial surface (Fig. 2b, c, g, h, i, j). In addition, leaf abaxial trichomes that coexist with the LAEWC vary between species: the parallel tuft trichome (Fig. 2d), stellate trichomes with papillae (Fig. 2a, d, e, k, n), solitary unicellular trichome (Fig. 2f), and broad base trichomes (Fig. 2c and j). Appressed parallel tufts were also present in eight species with LAEWC (Fig. 2a, d, e, f, k, n). Some species are glabrous on the leaf abaxial surface (Fig. 2b, c, g, h, i, j). The pattern of anticlinal walls and the shape of the epidermal cells are the main characteristics of the adaxial epidermis. Anticlinal walls are curved, straight, or sinuate. Epidermal cells are irregularly rounded, regular, or polygonal. No stomata were found on the adaxial surface (Additional file 1: Figure S1). The variety of trichomes between species are not the topic of this study but merit further investigation. According to species distribution modeling conducted by Maxent , with implementation of the R packages dismo , several species have overlapping distributions and these distributions are not obviously different between species with LAEWC and without LAEWC (Additional file 1: Figure S2). This result suggests the presence/absence of LAEWC is not related to the current distribution of species or may not reflect fine-scale environmental differences within a small island. The species tree revealed that species with LAEWC do not form a single clade; nor do species without LAEWC (Fig. 1d). A species tree reconstructed with six reference genes showed an ancestry for the studied Lithocarpus species dating to 24.19 Mya (Fig. 1d). Three independent lineages (clades) of species with LAEWC could be coalesced since 11.16 Mya, 10.74 Mya, and 1.55 Mya, and branches of non-LAEWC species could be coalesced to 6.47 Mya and 4.01 Mya (Fig. 1d). These dates are roughly in line with the late Miocene and Pliocene, which is older than the formation of Taiwan Island (less than 4 Mya) where the studied species are distributed [81–83]. Such dating indicates that the occurrence of these species in Taiwan was not a consequence of radiation after colonizing Taiwan Island but could point to multiple colonizing events. This inference was also supported by the chloroplast DNA tree with more taxa (Additional file 1: Figure S3). This result implies that the presence/absence of LAEWC was not the derived character for adapting to the island environment but could be a relict of an adaptive trait. The ancestor state (presence or absence) of LAEWC of Lithocarpus remains unknown because the phylogenetically closed genera (outgroups, Quercus and Castanea) have varied character states in LAEWC and ambiguous ancestral states inferred by MCMC simulation under the equal-rate (ER) model according to the chloroplast DNA tree (Additional file 1: Figure S3). 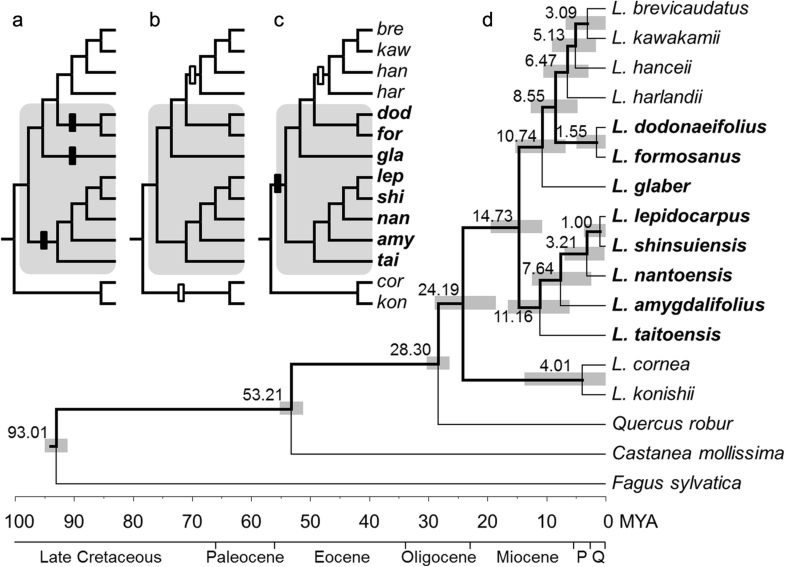 Nevertheless, the phylogenetic analysis still provides evidence that the presence or absence of LAEWC is not a single event in Lithocarpus evolution (Fig. 1 and Additional file 1: Figure S3). Therefore, at least three evolutionary scenarios of gain or loss of LAEWC could be hypothesized: (a) gaining LAEWC are independent events, (b) losing LAEWC are independent events, and (c) losing LAEWC is a reversal event (Fig. 1a-c). Generally, the grouping pattern of species with LAEWC and without LAEWC in the gene trees of CER1, CER3, and CER5 are similar to that of the species tree reconstructed from six reference genes, except that the haplotypes of L. harilandii (species without LAEWC) was grouped with L. dodonaeifolius (with LAEWC) (Fig. 3a-c). Certain species possess two haplotypes of the wax related genes and two haplotypes do not form a single clade, which was likely to be caused by gene duplication or retention of ancestral polymorphism . According to previously reported in model species, only one copy can be found in all of the CER candidate genes from all model species [10, 14, 85, 86]. Besides, most species do not possess more than one haplotype. Therefore, different haplotypes within the species were regarded as intraspecific polymorphism rather than different members of a small gene family caused by duplication. 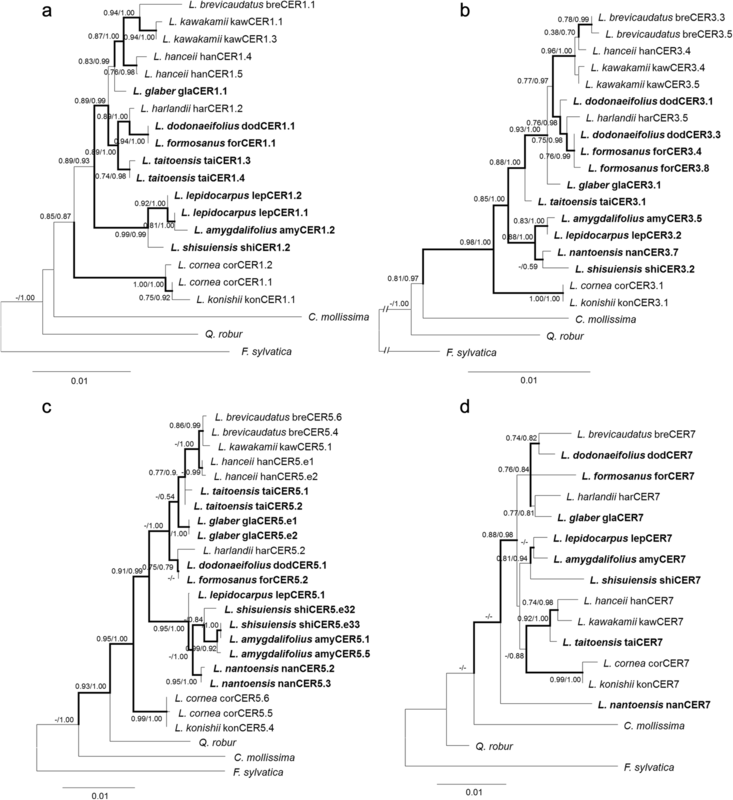 In addition, within the LAEWC group, which did not form a monophyly in either gene tree or species tree, the L. taitoensis grouped with L. dodonaeifolius, L. formosanus, and L. glaber in gene trees of CER1, CER3, and CER5 (Fig. 3a-c), but grouped with L. lepidocarpus, L. nantoensis, L. shinsuiensis, and L. amygdalifolius in the species tree (Fig. 1). The gene tree of CER7 is different from the other gene trees and the species tree, which revealed a mosaic topological distribution of LAEWC species with non-LAEWC species (Fig. 3d). Furthermore, all clones of CER7 are monomorphic within species (one haplotype per species), revealing strong genetic constraint of species. The null hypothesis of WSRT is that there is no difference in the median between pairs of observations, while the null hypothesis of SLR implies independent distribution (no relationships) between two sets of observations. Hence, we use WSRT to test the difference in evolutionary rates between LAEWC related and unrelated genes and the rate of functional and unfunctional change of LAEWC related genes. We also conducted the SLR to test whether the LAEWC related genes evolve independently of species divergence or not. The Wilcoxon test shows significant differences in K between LAEWC unrelated (reference) genes and CER3 (P < 2.2 × 10− 16), CER5 (P = 1.13 × 10− 6), and CER7 (P = 0.0005), but non-significant difference between reference genes and CER1 (P = 0.734) (Additional file 1: Figure S4A-D), which indicates that the evolutionary rate of CER1 does not differ from that of reference genes. Since most regions of the reference genes are non-coding regions (introns), which were suggested to be free of selection, we compared the K of reference genes with the nonsynonymous substitution rate (Ks) of LAEWC related genes. Significant WSRT results (P < 0.05 in all comparisons) suggested different rates between the LAEWC related genes and reference genes, but the positive significance of the SLR suggests that the silent mutations of these LAEWC related genes still follow the sequence of species divergence (Additional file 1: Figure S4E-H). When comparing the Ks of LAEWC related genes to the nonsynonymous substitution rate (Ka), very significant lower Ka for these LAEWC related genes than Ks was found by WSRT (Additional file 1: Figure S4I-L). Taken together with the comparisons of Ks of LAEWC related genes and the K of reference genes and the Ka vs. Ks of the LAEWC related genes, we concluded that these LAEWC related genes evolve more rapidly than other wax unrelated genes while experiencing strong selective pressure to constrain amino acid changes. The results show that, except in the CER1 scenario of gaining LAEWC (hypothesis 1, Fig. 1a; 2ΔL = 6.754, P = 0.009, Table 1), the constant-rate model (M0) cannot be rejected in other LAEWC-related genes under all evolutionary scenarios of trait-shift events. Although three branches that inferred gaining LAEWC have an estimate of ω > 1 in CER1 under hypothesis 1, not all branches were detected as having the same amino-acid replacement: only one and two amino acid replacements were found in L. glaber and in the branch of the common ancestor of L. dodonaeifolius and L. formosanus, respectively. No replacement was found in the common ancestor of other LAEWC species, implying a false positive. The gain of LAEWC in the early stages of the evolution of Lithocarpus was suggested to take place at multiple times and independently from a probable ancestral state of absence of LAEWC (Additional file 1: Figure S3). However, certain lineages of LAEWC loss were inferred (Additional file 1: Figure S3), but none of these “loss” events were suggested to be under selective pressure (Table 1). We also tested whether positive selection acts on retaining LAEWC by allowing ω > 1 in all derived lineages after gaining or losing the LAEWC trait. The results show that the null hypothesis of constant-rate model cannot be rejected in all situations (Additional file 1: Table S2). This implies that the episodic gains of LAEWC may be responsible for adaptive radiation rather than lasting divergence. To understand whether the gain of LAEWC benefits the adaptation of trees, certain ecophysiological traits concerning photosynthesis or stress defense, etc. were measured (Additional file 1: Table S3) and used as independent variables to correlate with the character of LAEWC. Except the C and C/N ratio (2ΔL = 5.791 and 3.845, P = 0.016 and 0.050, respectively, Table 2), the empty model cannot be rejected by the models with other independent variables (Table 2). Even so, the effect of C and C/N still fails to significantly predict the character state of LAEWC (P = 0.111 and 0.090, respectively, Table 2). These results suggest that the presence/absence of LAEWC does not covary with current ecophysiological traits, i.e. is unrelated to current environmental pressures. This result is consistent with the lack of covariance of LAEWC with other ecophysiological characters in phylogenetic principal component analysis (Fig. 4). PS analyses showed that no ecophysiological variables reflect species evolution, but the PA can reflect the gene evolution of CER1 (K = 0.483, P = 0.014) and CER3 (λ = 0.870, P = 0.011; K = 0.549, P = 0.007, Table 3). Significant PS of PA in the CER1 and CER3 gene trees suggest coevolution of the PA and LAEWC backbone genes. However, the hypothesis of phylogenetic conservatism in both chemical (PA) and physical (LAEWC) stress defense is rejected due to the K < 1. In addition to the PA, the C/N ratio that represents the potential growth rate and nutrient limitation may also reflect the evolution of CER5 gene (Blomberg’s K = 0.290, P = 0.034, Table 3). However, nonsignificant PS detected in C, N, δ13C, and δ15N, and YII in the CER5 gene tree and other gene trees (Table 3) indicate no relationship between the adaptive evolution of LAEWC and photosynthesis efficiency, water usage efficiency, and/or nutrient allocations. 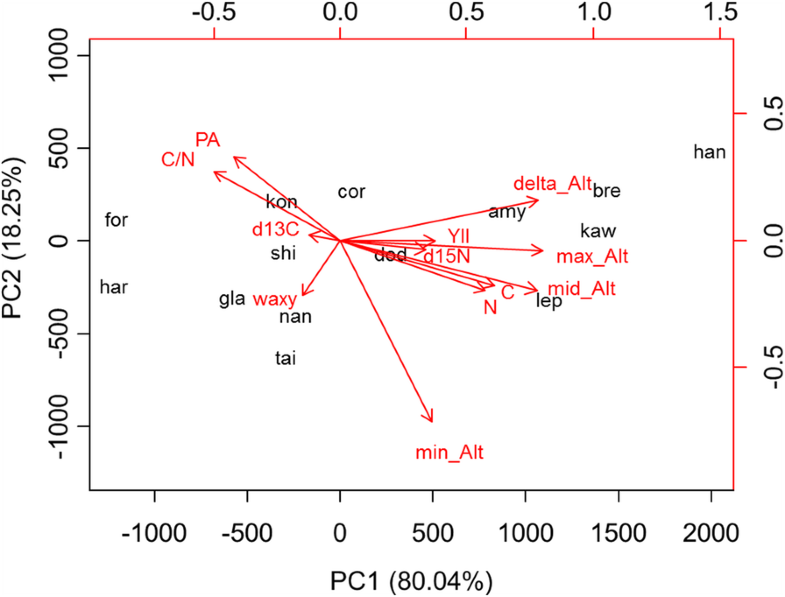 This study used 14 Lithocarpus species distributed on Taiwan Island to investigate the adaptive character of LAEWC by means of genetic and ecophysiological assessments. First, the SEM showed that eight of 14 species have an obvious film-shaped wax crystal structure on the leaf surface abaxial layer (Fig. 2) but only very sparse, or sometimes no, wax films were found on the leaf adaxial layer (Additional file 1: Figure S1). Lack of leaf adaxial wax crystals suggest no selective pressure or pressure of light intensity on the evolutionary shaping of leaf epicuticular wax in Lithocarpus (cf. ). In contrast, the differences in film-shaped wax crystals on the abaxial layer, where the stomata are mainly distributed, suggest the ecophysiological relevance of LAEWC in photosynthesis efficiency and/or water conservation. A study of grasses (Agrosti stolonifera, Poaceae) further indicated that the difference in distribution of the extracellular wax on leaf surfaces can also be related to the retention of salt at different localities . Interestingly, the presence of trichomes was associated with the presence of LAEWC in our study materials (Fig. 2) and the diverse forms of trichome have also been reported and discussed in previous study [42, 43], although it should be noted that few exceptions have been reported in species which were not adopted in our study (e.g, L. calophyllus and L. oleifolius in ). Co-occurrence of these traits may suggest, for example, that synergistic functions for adaptation play the role of physical barrier in the defense against insect biting  or water repellency . However, the trichome types are more complicated than the wax films in Lithocarpus (Fig. 2). Hence the trichomes’ ecophysiological functions, their potential linkage with wax films, the linkage of trichome morphogenesis related gene such as MIXTA-like , and adaptive characters are not discussed here. Most of the factors we measured do not reveal significant PS of the species tree, including photosynthesis efficiency, water usage efficiency, and/or nutrient allocation dependent characters. This is consistent with other leaf abaxial characters - for example, there are no distinguishable differences in morphology/distribution of stomata, abaxial epidermal cell walls, and epidermal hairs [42, 53] - although we could not exclude other factors driving adaptation in Lithocarpus. Among these factors, the contents of PA revealed significant PS with the gene trees of the backbone genes of the wax biosynthesis pathway (i.e. CER1 and CER3, Table 3). The makeup of defensive chemicals usually directly reflects the herbivore stress of plants and reveals strong signs of positive selection [91, 92]. Cuticular or epicuticular waxes of the leaf surface are suggested to play a role in physical defense [60, 87]. Two hypotheses could explain the coevolutionary relationship between the chemical and physical defensive strategies: (1) the trade-off between the chemical and physical defensive investment that causes negative results of correlation [30–32], and (2) synergistic defense hypothesis suggests a positive correlation between chemical and physical trait values . Similarly, the trade-off between the defensive and growth investments in plants could result in negative correlations between the defensive and photosynthesis (or nutrient) trait values. However, our study shows neither a positive nor a negative correlation between chemical and physical defensive traits, as well as no correlation between LAEWC and photosynthesis or nutrient uptake/storage indices (Table 2). This means that the trade-off hypothesis for the resource investment of chemical and physical defensive strategies is not supported. Our result is similar to that found in myrmecophilic plant Macaranga tanarius which showed that the chemical composition of the leaf revealed no correlation with the wax contents of the leaf surfaces . However, in that case, a strong positive correlation with the density of trichomes was detected, suggesting complicated synergistic defensive strategies of plants . This study echoes the above and considers trichomes worthy of future exploration. At the same time, the phylogenetic PCA revealed the opposite explanatory dimensions on the chemical defensive trait (PA) and other nutrient and photosynthesis indices (Fig. 4), showing support for the trade-off hypothesis between defensive and growth investment in Lithocarpus. Evidence in support of another hypothesis, that spreading the risks of resource investment resulted in general phenomenon of less or no association between defensive traits, i.e. independently evolving, was not uncovered . Though we failed to find correlations between any ecophysiological trait and LAEWC (Table 2), our study has found evidence for a strong relationship between PA content and the evolution of backbone genes of the wax biosynthesis pathway. One of the backbone genes, CER1, was also found to be positively associated with gaining of LAEWC (Table 1), suggesting a synchronization of the relationship between the evolution of chemical and physical defensive traits. Although other potential functional interpretations could be considered in CER1 - for example, pollen morphogenesis  and adaxial wax cuticle  - the possibility of adaptive interpretation in pollen or adaxial wax cuticle seems to be unlikely due to very little variation in pollen  and adaxial cuticle morphology [53, 54]. Therefore, we focus our discussion on defensive traits with LAEWC and CER1. Contrasting hypotheses of parallel evolution and coadaptation explain how the chemical (e.g. PA) and physical (e.g. LAEWC) defensive characters covary: the former describes synergistic evolution of both traits following species divergence, while the latter suggests synchronous changes of characters in response to the same stress but independent from the evolution sequence of the species. In this case, nonsignificant PS of the PA with the species tree has excluded the possibility of parallel evolution of these two traits. Several studies have shown independent or unlinked relationships between the chemical and physical defensive traits and do not support the parallel evolution hypothesis of two defensive strategies [42, 87, 93]. In contrast, a coadaptive evolutionary relationship in both PA and LAEWC was suggested due to significant PS of PA on the backbone genes of wax biosynthesis (Table 3). In addition, the positive selection on the CER1 gene at the time of gaining LAEWC implies that the association of PA with the evolution of wax backbone genes reflects the adaptive consequence of character innovation. Besides CER1, none of the examined genes have signs of positive selection in any possible evolutionary scenarios (Table 1). Positive selection on backbone gene CER1 suggests that the trait shift of LAEWC is the overriding functional change for adaption. Overexpression of CER1induced by osmotic stresses will increase the production and accumulation of the raw materials of cuticle wax, which was shown to increase plant susceptibility to bacterial and fungal pathogens as well as reduce cuticle permeability and soil-water deficit susceptibility in Arabidopsis . Although the state of LAEWC in the common ancestor of the extant Lithocarpus is ambiguous, the gaining of LAEWC likely happened in the early stages of species divergence (Additional file 1: Figure S3). This idea is supported by the absence of LAEWC in the sister group, Chrysolepis, after observation by SEM . The positive selection detected upon the of gaining of LAEWC indicates adaptive advantages of LAEWC in Lithocarpus. Furthermore, the selective pressure on CER1 was not retained for maintaining the character (Additional file 1: Table S2). Functional traits of leaves such as the specific leaf area and hydraulic traits were suggested to be associated with the species niche and strongly reflect species distribution [95, 96]. However, modeling for species distribution based on current climate variables indicated no obvious differences between the species with and without LAEWC (Additional file 1: Figure S2). This may suggest that the trait of LAEWC may reflect past environmental change which led to trait shifts rather than current environmental realities. The timing of the trait transition of LAEWC was suggested as the late Miocene and Pliocene (Fig. 1). Late Miocene to Quaternary climate change may coincide with the trait shift events of LAEWC in Lithocarpus. The Miocene climate was slightly warmer and wetter and spawned the monsoon system which has affected Asian vegetation [97–99]. After the late Miocene, the climate gradually cooled and became arid [100, 101]. The late-Miocene-to-Pliocene climate change accelerated the diversification of insular species [102–105], which may be partly due to sea-level fluctuations accompanying disjunction and connection between continents and islands . The synergy of genetic isolation and adaptation to the rugged topography may have accelerated the speciation process in southeastern Asian islands. Trait innovation has been found to enhance the diversification of several plants since the late-Miocene-to-Pliocene boundary. For example, the appearance of winged seeds in Parrya and Diptychocarpus of Brassicaceae may aid in plant colonization . As with Parrya and Diptychocarpus, acquiring the LAEWC to increase survival by defending against insects may have accelerated species diversification in these tropical and subtropical stone oaks in the late-Miocene-to-Pliocene period at the same time that insect species were diversifying, including tropical-forest beetles , most genera of Nymphalid , and fruit fly (Rhagoletis, ). In addition, some plant species developed higher drought adaptability usually characterized by water-conserving traits (i.e. high hydraulic safety margins) and, as with the presence of LAEWC in Lithocarpus, show a higher potential of resistance to climate change . However, although these traits can reflect environmental and climate change, they may act somewhat independently of one another , hence these traits were poorly correlated with each other (Table 2) in our study. This may be because the specific combination of traits may maximize species performance only in specific environments . The late-Miocene-to-Pliocene positive selection on backbone gene CER1 of leaf epicuticular wax accompanying the content of PA of chemical defensive traits suggests the adaptive change and diversification rate coincides with the diversification of many herbivorous insects and potential link between PA, wax, and defensive adaptation in Lithocarpus. The selective pressure which produced this linkage did not persist over time; however, the trait transition has remained. None correlation of the wax trait with the other ecophysiological characters suggests functional independency. The evolutionary association in chemical and physical defensive strategies was suggested as a coadaptive phenomenon to resist multiple or complicated phytophagous stress instead of reflecting the parallel evolution of traits. Our study began with a morphological observation and concluded having found evidence of the synchronous adaptive change of defensive traits under past selective pressure, uncovered through genetic and ecophysiological analyses. We contribute a possible explanation of the mechanism for the diversification of tropical and subtropical forest species in the face of climate change. Chih-Kai Yang and Bing-Hong Huang contributed equally to this work. The authors thank Shih-Ying Hwang, Yu-Chung Chiang, and Chun-Neng Wang for their suggestions to improve this study, and thank Dawn Schmidt and Dr. Rosemary Pennington for English editing. We thank the National Center for Genome Medicine of the National Core Facility Program for Biotechnology, Ministry of Science and Technology, for the technical/bioinformatics support. This research was financially supported by the Ministry of Science and Technology in Taiwan (MOST 105–2628-B-003 -002 -MY3) and was also subsidized by the National Taiwan Normal University (NTNU), Taiwan. All sequences presented in this study were deposited in the NCBI GenBank under Accessions KY458808-KY458955. PL and JW conceived this study. CY and SH collected materials. CY, BH, MH and SH conducted experiments. BH, JG and SH analysed the data. PL wrote the paper. JW, CY and BH critically reviewed the manuscript. All authors participated in the discussion and read and approved the final manuscript. Hijmans RJ, Phillips S, Leathwick J, Elith J. dismo: Species distribution modeling. R package version 08–17 2013. Available online at: http://cran.r-project.org/web/packages/dismo/index.html.